Is it really almost May? With snow dusting the country, and people pulling their puffer jackets out of storage again, it’s hard to believe that May is just around the corner. But Attic Self Storage has a vested interest in spotting reasons – and seasons – that customers might need us, so we’ve been scrutinizing the calendar. May we encourage you to put a few dates in your diary for the forthcoming month? May 1st – May Day. Celebrations have their origins in the Roman festival of Flora, goddess of fruit and flowers. The original tradition involved Maypole Dancing. People used to cut down young trees and stick them in the ground to mark the arrival of the fine weather (!) that would allow planting to begin. Maypoles were once common all over England and were kept from one year to the next (in Ye Olde Attic Selfe Storage facilitye, no doubt). They’d practice skipping round the pole for weeks before the final show on the village green, which would end in a beautiful plaited pattern of ribbons or a tangled cat’s cradle, depending on how much rehearsing had been done and how much mead they’d drunk. 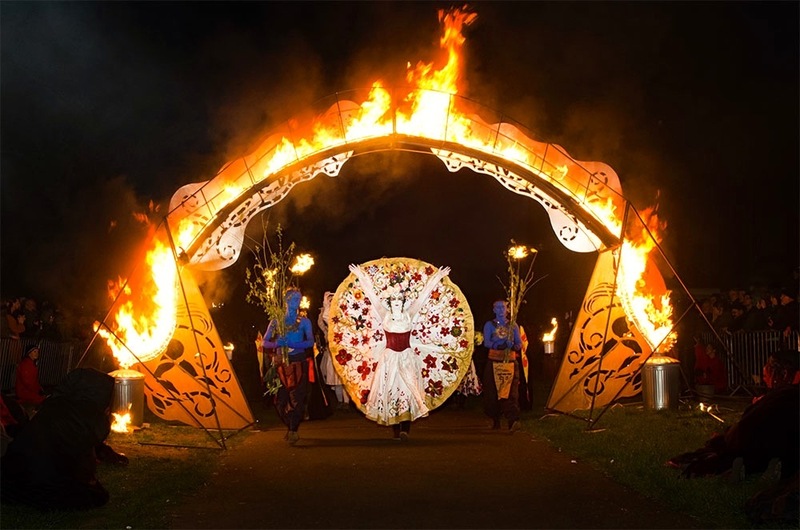 May Day is also Beltane, the Celtic festival of fire. A celebration of fertility and burning stuff. We are happy to provide somewhere secure to keep your 30-foot Wicker Man throughout the year. Morris Men can also get sensible advice about storing their sticks, instruments and ankle bells from our helpful front of house staff. May 2nd – Bank Holiday. Our local green space, The Queen Elizabeth Olympic Park, is alive with activities this month, kicking of with the ‘Be Moore Fun Run’ this Monday. It might be a little late to take part, but there’s plenty of room for spectators. And there’s space at Attic Self Storage should you wish to put your running gear, or West Ham strip, in a locker. May 4th – Don’t forget to tweet or text your Star Wars obsessed friends with the timely phrase ‘MAY THE FOURTH BE WITH YOU’. And remind them that Attic Self Storage can provide a state-of-the-art hanger for that life-size Millennium Falcon model they’ve been making out of matchsticks. May 5th – The London Mayoral Election. Things are hotting up as polling day approaches. Whichever candidate wins, we’d like to remind them all that Attic Self Storage is the politically neutral place to stockpile their rosettes, placards and balloons. May the fifth is also ‘Cinco de Mayo’. Celebrating the Mexican army’s surprise victory over invading French forces at the Battle of Puebla in 1862. 4,000 Mexican soldiers beat a well-equipped French army of 8,000 that hadn’t been defeated for almost 50 years. Local Mexicans are most welcome to store their Mariachi equipment, tequila, tacos, jalapenos, and over-sized straw hats with us until they’re needed. And if you’re French ­– perhaps it’s finally time to put your vintage uniforms and weaponry away now. May 8th – ‘Vitality Run Hackney’ is a flat, fast half marathon that runs through Hackney’s many green spaces as well as the Olympic Park. Now in its third year, the event is one of the top ten half marathons in the UK. The streets are lined with supporters and live entertainment punctuates the route. Talk to Attic Self Storage if you need somewhere to keep your sound system. May 9th – 22nd – ‘Len European Aquatics Championships 2016’ is the biggest event to be held at the Aquatics Centre since the 2012 Olympics. Over 900 athletes are due to compete in swimming, diving and synchro disciplines at the last major event before Rio 2016. Why not go and cheer on local stars Tom Daley and Georgia Ward? There’s always room for inflatable crocodiles at Attic Self Storage. May 10th ­– ‘Clean Up Your Room Day’. Every American kid’s nightmare. Attic Self Storage reckon they should introduce it to the UK and encourage our own children to pick up their ­– ouch! – bloody Lego bricks. May 15th – ‘The RBC Race for the Kids’ is Great Ormond Street Hospital Children’s Charity’s annual 5km family fun run through the Olympic Park. A great opportunity to get a team together and help raise vital funds. We’ll be supporting with a donation. May 29th – This day in 1453, the official Middle Ages ended—allegedly. The conclusion of one era ushered in the Renaissance. Attic Self Storage is the modern place to keep your village stocks and ducking stools until you might need them again. Or somewhere safe for your collection of Titians. Monday, May 30th 2016 – Spring Bank Holiday. Another bank holiday and welcome day off for everyone. Well almost everyone. We’ll be offering 24 hour access as usual. May 31st ­– According to the Met Office the first day of meteorological Summer is tomorrow. Let’s hope it’s finally time to get those BBQ units out of the attic. May you have a wonderful month. Including the Home Secretary*.